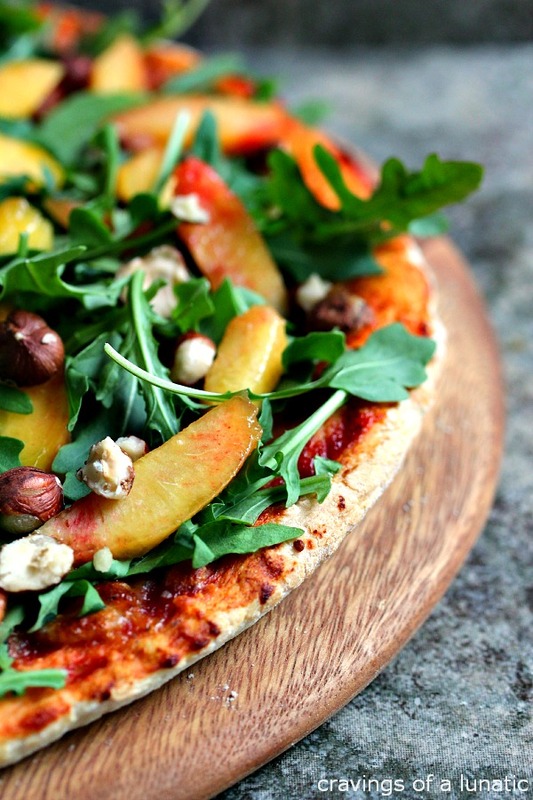 Amazing Pizza layered with Arugula, Fresh Peaches, and Chopped Hazelnuts. 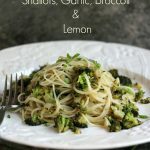 This recipe is a real crowd pleaser and perfect for summer! This is a sponsored post for Aurora Importing. All opinions are my own, as always. Thanks to all the companies, and readers, who help support Cravings of a Lunatic. I know, I know, this is a weird pizza in the eyes of some people. But I don’t really give a hoot. 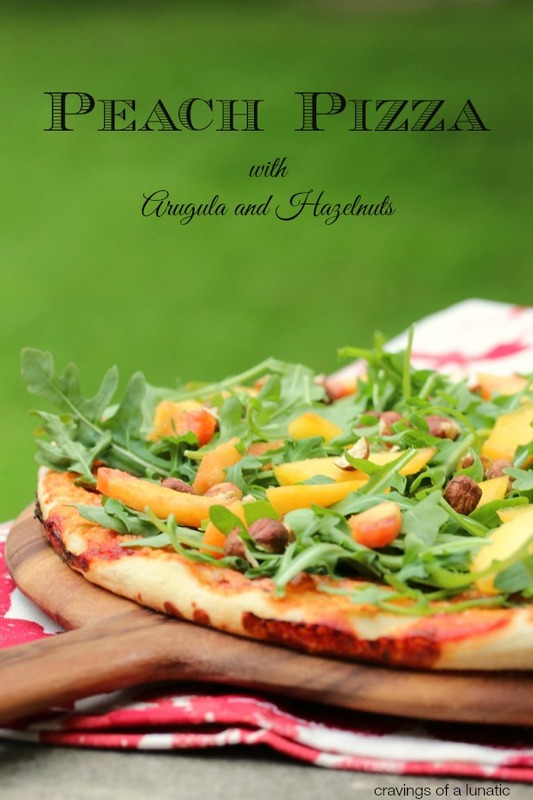 This pizza is layered with sauce, pizza mozzarella, tons of arugula, fresh thinly sliced peaches, and chopped hazelnuts. I love peaches, there is nothing quite like the taste of a fresh peach. Peach season makes me giddy. You know what else makes me giddy? Making my own pizza dough. If you haven’t tried it you’ve been missing out. Making your own pizza dough is a game changer. Once you start you won’t want to stop. I’ve made hundreds of batches of pizza dough in my lifetime. We eat pizza about 3 times a week, minimum. We’re nuts like that. I’ve tried so many different kinds of flour to make dough. Colour me happy that I’ve finally found the “perfect” flour. I’ve been working with Aurora Importing recently, and they sent me some great products to try out. They sent me their Pizza Flour and I cannot even begin to put into words how good it is. It made the best pizza dough we’ve ever had. You totally need to try this pizza. With the flour from Aurora Importing. Then stop back here to let me know what you think. M’kay. Spray two pizza sheets generously with non-stick spray. Divide dough into two. Hand stretch (or use a rolling pin if you prefer) the dough and place over top of the pizza pans. Stretch it and give the edges a bit more dough to get a thicker crust around the edge. Just use your fingers to push it and into to edges so it's about twice the height as it is in the middle. Now spread the pizza sauce evenly over both pizzas. Toss the mozzarella over top, you can use more or less depending on taste. We like ours pretty cheesy, but you can use less if you like prefer. Place the pizzas in the oven, and cook for about 8 to 12 minutes, depending on how dark you like the bottom, and the brown you like the cheese. We put on on the bottom rack and one on the middle rack, then rotate them halfway through the cooking process. Remove the pizzas from the oven. Toss the arugula on top of the pizzas. Spread the peaches evenly over the pizzas. Then sprinkle the hazelnuts over top. Use a pizza wheel to cut the pizzas while they're hot. Serve with a big old peach pizza loving smile! 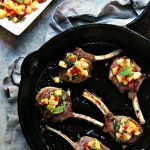 This is fabulous with balsamic peaches and my special peach sauce too. I'll be sharing that recipe next week. You will freak out! You can also grill this. The peaches are fabulous if they are grilled then spread over top of the pizza. You can substitute nectarines if you like them. Warming the peaches up in pan with a little brown sugar is another fabulous way to do this. I encourage you to try this pizza out. It’s freaking spectacular. 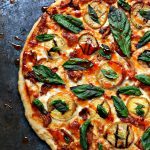 I love putting fruit on pizza, it just puts a fresh spin on it, particularly in summer. When you make this I highly recommend ordering Pizza Flour from Aurora Importing. It is far superior to any other flour I’ve used. It completely rocked my pizza world, and that’s not easy to do. I am not easily impressed when it comes to pizza, so this is high praise from me. I’m back in the kitchen cooking up a storm and loving every minute of it. I’ve got a great salad coming soon. There’s also some ice cream, and summer drink recipes. I even made popsicles. It feels so good to be back in the kitchen! Disclosure Mumbo Jumbo: This post is a thank you to Aurora Importing for sponsoring me for Blogher Food. As my readers know I only work with companies I trust and use on a regular basis. All opinions are my own. Aurora Importing paid for me to attend Blogher Food. I am eternally grateful. This pasta would be perfect for Fathers Day. Or any day really. Hope you have an awesome weekend! This is the sexiest pizza I have ever seen. Ha, thanks lady. I had fun with this one. Great pizza! Although I usually eat the “traditional” toppings, I like to experiment, too. Sounds like you found a great pizza flour! Is it 00 grade, or doesn’t the package say? Anyway, super post — thanks. The flour that Kim used is Molini Pizzuti for Pizza, and it’s “Tipo 0”. We also carry “Tipo 00” flour from Molini Pizzuti (http://www.auroraimporting.com/product/molini-pizzuti-farina-tipo-1kg/) and Polselli (http://www.auroraimporting.com/product/polselli-italian-flour-type-00-classica-1kg-bag/). We tend to be meat toppings people but every now and then I like to get all fancy shmancy. The flour is the amazing. If you get a chance to try it give it a whirl. Andrés left you the link if you’re interested. It’s the best flour for pizza I’ve ever come across. And as you know we make pizza at least three times a week here. Mini-me is a pro from working at the pizza place for years. Her thoughts on the dough were that it stretches so much better. The elasticity is amazing. You can hand stretch it no problem, throw it or roll it. It doesn’t break or tear when you stretch it either. That’s a big problem with a lot of other dough. She’s a tough pizza critic and she raved about this stuff. I’ve been told to order at least 5 more bags pronto. Ha. What a lovely looking pizza!! YUM! This pizza is beautiful and SO not weird!! It’s the best of a pizza and a salad all in one! Thanks so much Amanda. I love arugula on pizza so it was an easy leap for me. OOh yum what a great combo! 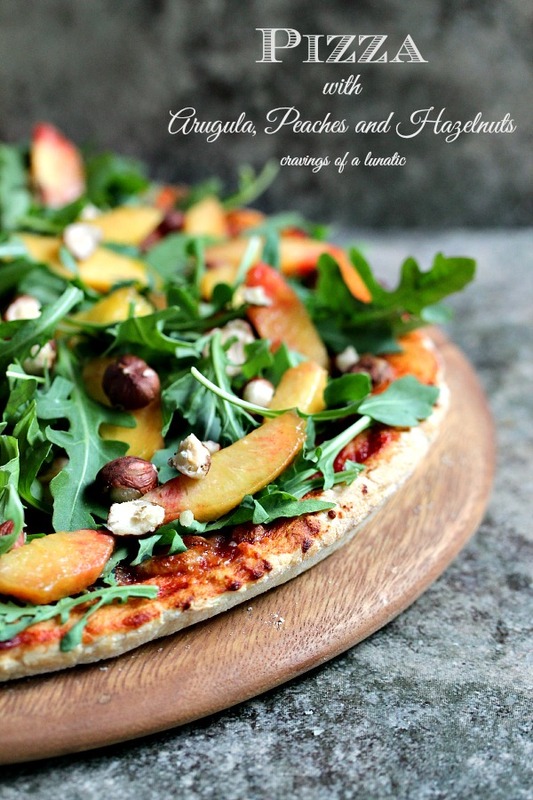 I’ve never tried peaches on pizza but love arugula and hazelnuts! I had a peach salad in Miami and loved it so much. So that sort of lead to this. I was so impressed how it turned out. Hope you get to try it. Now, this is an unusual pizza and it sounds delicious! Thanks Ginny. I love mixing it up with pizza. We eat it so often I like to play around with flavours. So not weird in my eyes! 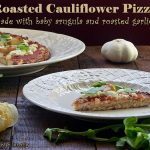 I love all kinds of pizza and fruit with greens and nuts and cheese is just up my alley – can’t wait to try it out! Thanks Deanna. I hope you love it. I am trying out another one with a peach sauce that I’m hoping works well. I’m obsessed with pizza lately. I like peaches in evvvvvry meal during peach season – it’s far too short! And homemade pizza is a weekly hit around here, I need to try this combo. Me too. We don’t have them long enough to make me happy. Way too short. We eat pizza way too much. My daughter just loves pizza so we probably eat it in some form about 3 times a week. We make it for lunch a lot on weekends. She always helps, so it’s so much fun. I love peaches! This post doesn’t gross me out, it makes me really curious! I’ve never had peaches on pizza. You totally have to try if you love peaches. It’s so good. I’ve got another one in the works that uses hot peaches. Hoping it turns out as well as I think it will. My eyes do NOT think this is a weird pizza at all.. Gimme!! Ha, I am so glad you like it Shaina. That peach salad we had in Miami was sort of the catalyst for this. I’ve been obsessed with peaches ever since I had that salad. I have done peaches and I have done arugula on pizza before. Both amazing. But never nuts of any kind. I am loving this version. I will have to try it out soon. Thanks Emily. I adore pizza so I’m always dreaming up new versions. It’s a complete obsession of mine. That pizza! That is the pizza of my dreams. You have no idea how happy that made me. 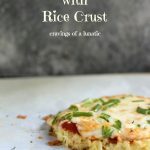 This is an INCREDIBLE pizza recipe. 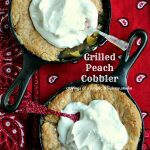 The crust sounds amazing and I love that you added peaches to the top! Gorgeous pics, too! Thanks so much Betsy. I had so much fun with this recipe. It’s such a fresh pizza for summer. This pizza looks just perfect! 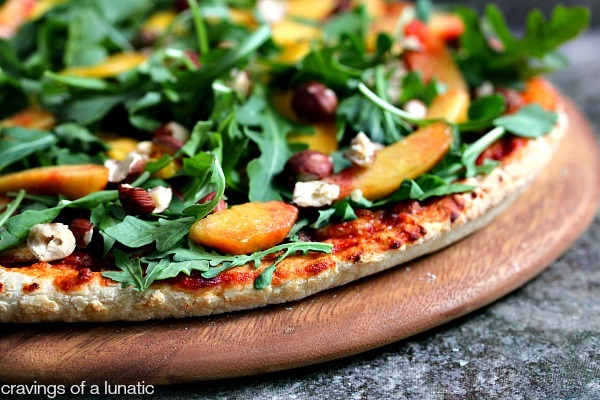 Love the combination of arugula and peaches! Thanks so much Angie. I heart pizza. Normally I wouldn’t even think to put those things on a pizza but oh my that does look amazing! Ha, I know right. It’s a bit out there, but once you do it you will want this stuff all the time. Arugula with Prosciutto is also the bomb. Thanks so much Connie. I really enjoyed making this. And eating this.